The Chief Missioner of Nasrul-Lahil-l-Fath Society (NASFAT), Imam Onike Abdul-Azeez, on Thursday urged Nigerians to promote religious harmony, peaceful co-existence and tolerance in the nation, to sustain development. Abdul-Azeez, who gave the advice in an interview with the News Agency of Nigeria (NAN) in Lagos, noted that no country could achieve meaningful development in an atmosphere of religious chaos and uncertainty. The cleric said that peace and religious co-existence was a vital element to the development of the nation. “We must come together as one, even at this particular point of Nigeria’s transition; we do not need violence, bloodshed, acrimony and hatred. “The Quoran and the Bible teach love; we should eschew our differences, forget all our biases, our hatred, and all those things that militate against our well-being,’’ he said. According to him, peace is fundamental to the development and sustainability of the country, and people should always verify information before disseminating it. “We should be sincere with ourselves; in recent times, we realised that some people are fanning the embers of discord. I don’t know what they will gain by doing that. “We should be patient, cautious and peaceful; we should not peddle rumors; we should verify any news before spreading it. People are deliberately distorting information,’’ he said. Abdul-Azeez urged religious leaders to teach their adherents the importance of peaceful co-existence, noting that NASFAT was educating their missioners on the need for peace. “You can only obtain peace when you educate people on the importance of peace. 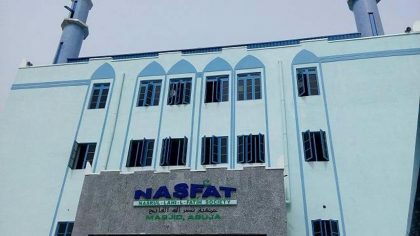 NASFAT has taken it up to educate its missioners on the need for peaceful co-existence and the need for good interfaith relations,’’ he said.